New Adventure: Judge Not By The Cover Now Available! 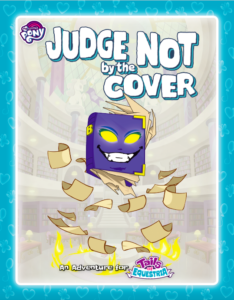 We are excited to announce that Judge Not by the Cover, a new adventure for the Tails of Equestria Storytelling Game, is now available and will be hitting shelves in your local stores soon! In Judge Not by the Cover, you’ll find yourself setting out on a quest from the Crystal Empire, following an old map left by Starswirl the Bearded. At the other end lies a mysterious and magical library that only appears once every hundred years. Even with all his skill and research, Starswirl was never able to find the library, but he did leave a clue to the whereabouts of its future appearances. The library is set to materialise in Equestria again very soon, and only Starswirl’s map can lead you there! Finding the library is only the beginning. What lies within, nopony knows, and only the bravest and most skilled adventurer will be able to discover the secret of the library and the identity of its enigmatic curator. Dea, a sentient book of unknown origins, is one of the many unfamiliar faces you’ll find waiting in the vanishing library. 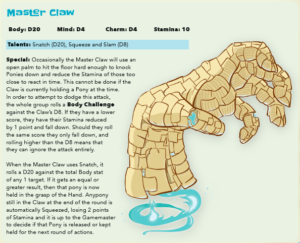 What magic has brought this tome to life, and is he a trustworthy companion? His knowledge of the library’s depths will certainly be useful for any adventurer. Meanwhile, in the deepest parts of the library, another sentient tome is forming an army of paper monsters and minions. As you work to discover the secrets hidden within, you’ll have to face off against these magical paper golems and their crazed creator. The Origami Army is as dynamic as it is powerful. You never know what form the next enemy will take! A multitude of origami creations dwell in the vanishing library, waiting for intruders. You can pick up your own copy of Judge Not by the Cover from our store. Keep your ears to the ground and eyes on our website and Facebook Page for future updates regarding Tails of Equestria! Pacific Rim: Extinction BackerKit Available! Jack Caesar on heading Underwa... Kickstarter Exclusive Osta Vasilek starts production!